Access into the game and beginning a multiplayer battle is simple and easy. After selecting Zendoku and a character, the options are all along the bottom of the touch screen, and the multiplayer icon is the only one with two people. The opening credits are not skippable, but they're also not obnoxiously long. Download time is just over a minute (on average). Menu options are sometimes large and sometimes small, but always accurate to where you tap, with enough space to tap on for each target. Placing a symbol is as simple as tapping on the symbol's tile outside the board and then tapping on the square you want it to put it in on the board. Knowing where to put the symbols and accuracy in tapping are up to the player. The game is extremely accurate overall, but a zoom feature to make the tiny squares slightly less tiny would be very nice. There is no way to place "possible solutions" in the squares. The graphics of the symbols are small, but very sharp (sharper than in Toon-Doku). The characters are stylized and are unique and creative. The in-game sound is mostly a composition of sound effects, but they're very useful in knowing when your opponent is sending attacks at you before they arrive. Turn the sound off at your own risk. The game is rather light on features, however, with the host getting to select their character (only the host) and the difficulty of the board (five difficulty levels). There is no downloadable demo for single-player play. Fortunately, the game randomly generates boards, so you'll (probably) never see the same board twice. There are plenty of Sudoku games on the market - well of a dozen, not to mention other games that include Sudoku (like Brain Age: Train Your Brain In Minutes A Day!) - so the market is pretty well saturated. What do you do if you're a game designer steadfast in your desire to release yet another Sudoku game into the market? The only successful solution is to do something unique: something that potential players can't get from any other Sudoku game. In this case, Battle mode! "Battle what?!?" I hear you weep. Fear not, yon Sudoku sage. Zendoku actually got it right. Sure, it's a new concept, but I found no serious flaws in the design or the gameplay, and yes - it's actually fun. The developers of this game were very aware that casual gamers unfamiliar with video game systems often pick up new versions of familiar games, and it shows. The game is easy to get into and the controls are just about as simple as they possibly could be. Overall, Zendoku's a pretty good game, but don't get me wrong - it's not perfect. There's a Clasic Sudoku mode in the single-player experience, not no Classic Sudoku demo. Also, guests can't select their character. I recommend Zendoku not just because it's fun and because it's Single-Card Download mode accurately depicts the main game, but also because it's different (in a good way) and because it achieves true multi-player interaction. I'll be playing this one again from time to time. Include Single-Card Download Demos of both classic Sudoku and a Zendoku battle Vs the game's AI. Allow guests that download the game to select their character from a list (even if it's a shorter list). Permit players to switch between Co-Op and Battle without having to disconnect and reconnect. Add in tutorials (one for traditional Sudoku and one for Zendoku changes) and make them downloadable. Feature the ability to zoom in (a little) to allow players to make the grid larger. Accept up to four (or eight?) players using teams. 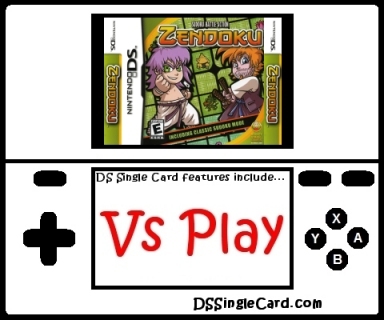 Click here to return to the DSSingleCard.com Zendoku profile.